The PICkit™ 2 Programmer/Debugger is a low-cost development tool with an easy to use interface for programming and debugging Microchip’s Flash families of microcontrollers. The full featured Windows programming interface supports baseline, mid-range, PIC18,8-bit, 16-bit, and 32-bit microcontrollers, and many Microchip Serial EEPROM products. With Microchip’s powerful MPLAB Integrated Development Environment (IDE) the PICkit 2 enables in circuit debugging on most PIC microcontrollers. In-Circuit-Debugging runs, halts and single steps the program while the PIC microcontroller is embedded in the application. When halted at a breakpoint, the file registers can be examined and modified. 1. This device will work like the normal pickit2. 3. No mosfets no complex, only one voltage boost circuit. 4. you can program the target without PC. Firmware is the software which going to be burn into programmer's microcontroller, this firmware have code to enable the programmer to communicate with pc via usb and target microcontroller. you can also download the firmware form the microchip web site. For Supported device list Please refer to Readme.txt and pickit 2 user manual for details on building, installing and using Pickit 2.
you can skip IC3 and IC4 if you do not want the feature of programming without PC. these two eeprom chip are to store the code to be written on the target mcu without pc. 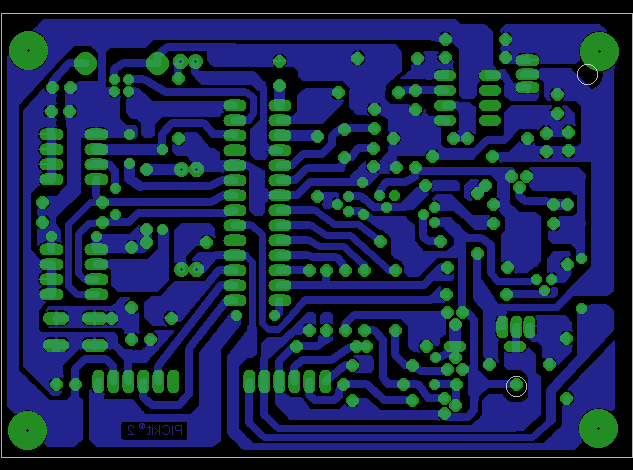 You can create your own pcb using any PCB editor like eagle, OR you can solder the circuit a general purpose pcb, You Can also Use PCB created By me Click here to dwonalod my pcb design. Getting the PIC 18F2550 microcontroller ready to be inserted into the newly soldered pcb ,and start working. you have to burn the firmware which you just downloaded in the Step 1﻿ into the PIC 18F2550 microcontroller. 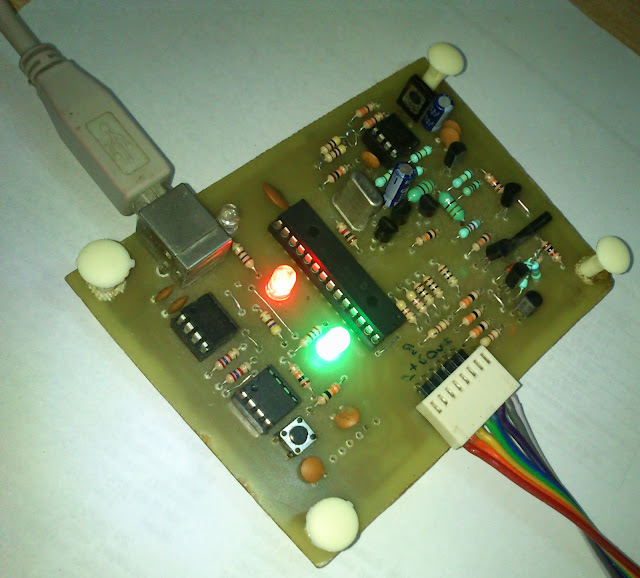 you can use the serial PIC programmer to get this job done.click here to know about how to make a serial PIC progammer and how to program the PIC 18F2550 by using a serial avr programmer. At the first time when you connect your programmer to the pc your programmer will be dected as Pickit 2 programmer and you may have to provide a proper path for drivers to be installed. To download PICKIT 2 Software click here to go to Mircohip web site. To dwonload MPLAB IDE go to Mirochip web site. 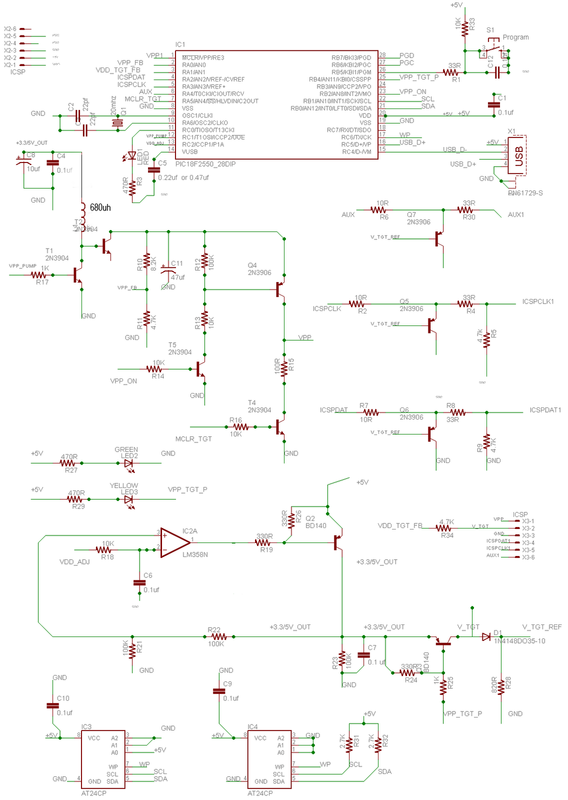 you can programe may microcontroller by using this schematic , all you need to do is that find out the data sheet of that mcu you want to program and check the pin configration. and the look for PIN PGC(clock) PGD(data) Vpp(/MCLR) and the power Vss And Vdd like shown in the image blow. Did you do any modification from my version? does this have VPP first programing? i posted a link on my post. thanks for helping people out there. Design looks very nice. in this circuit hw can i program pic18f2550 used,pls post serial programmer without using any mcs.it will be use full for many beginners. it seems like VDD is not configurable and VDD calibration (Calibrate VDD & Set Unit ID...) might not work? Other functions work just fine, nice work! No sense to waste the time and money to build the programmer, I was buy from ebay pickit 2 (clone from original) from(sure electronic-china) for 22$usd with transport included. serial port programmer in the link doesnot support usb to serial converter,pls post circut with usb2serial compactable .Iwant to make this circuit. in order for someone as new as me to get things clear, are the following steps in the good line ? 6)Instal Pickit2 software and MPLAB IDE from Microchip. ..and then we are ready to use the pickit2clone to program other pic's ? Dont pay attention to dachomk. This is a super blog and a super sircuit and people will feel happy after making this by them selfs. By the way...Greetings from Greece were the REAL Macedonia is for over 2500 years now. you are correct with the steps..
and you can use any programmer you want to first program the 18f4550 . i have just giving suggestion only for those who don't have any programmer at all . can i change pic18f2550 to pic16f73,wat changes heve to be made?. 1)transistor Q2 is very very hot,bt Q3 is fine. pls pls help me to correct the circuit. PCB printing from pdf is not accurate. 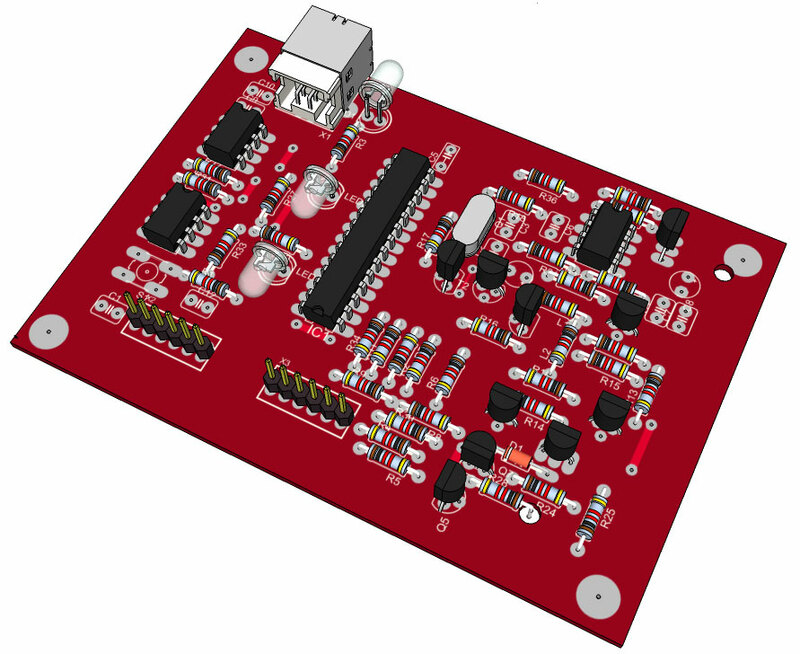 Could you please provide us the soft pcb file? Every thinh looks fine , except the vpp genration section . If any of the transistor get hot then it means you have done some mistake is placing component or transistors. here pre assmbled inductors are not available in the market,in this circuit what is the max tolerance for inductor,in my circuit i used wire winded type bt i doubt wat its value ?,is it critical? I replaced my inductor with same with more numbr of turns ,now i tested it again now i found vpp is 11.6 volts is it sufficent?,or does it need exactly 12.00 volts. if can't find the inductor then, may be you should look for them in some old electronics gadget. and 11.6 volt is fine i think that's enough. yes,i got exactly wat you said ,it look like 680ohms 1/2watt resistor(marked L1),BUT when i toubleshoot again voltage vpp is 10.4volts and it is saying vpp is low.wat may be the problem?,or 10.4 is enough? you can skip these eeprom if you do not want the feature of programming without PC. these two eeprom chip are to store the code to be written on the target mcu without pc. i have MPLAB version 8 and PICDEM .hex file burning software.... can i burn new PIC's with above softwares and this circuit,,,? I want to know if I can use instead of AT24CP, 24LC512 as it is in the original pickit2? you can even skip these eeprom if you do not want the feature of programming without PC. these two eeprom chip are to store the code to be written on the target mcu without pc. I want to make these programmer and I have another question.I want to know an equivalent for 2n3904. 2N2222 would go instead? I use PIC16F877A but I don't programming.I tried the system in computer and notebook but each time I read " PROGRAMMING FAILED AT MEMORY ADDRESS 0x000000"
the hardware looks fine have you connect the VPP(mclr) to the mclr of the target mcu Pin Please if Possible try to Program some other mcu like some other family PIC18 or something. and which version of Pickit 2 APPLICATION you have on the computer it looks quite strange in the images. I tried two different interface (Interface ver: 2.60 and 2.61) and I read errors " PROGRAMMING FAILED AT MEMORY ADDRESS 0x000000"
n please let me know if the programmer does same for some other mcu like pic18. आपकी समस्या का हल हो गया? I want to know an equivalent for 2n3904. 2N2222 would go instead? This cicuit is not capable to generate a VDD voltage source lower than 5V because is not well designed. I simulated the op amp part in proteus and i have found that by removing R36(240R) the op amp works correctly. The corectness of voltage sources depends whether r22=r23. plz i want to ask if i can use an inductor about 800uh instead of 680?? but you mean by a crap nokia charger the Chinese replacements or orginal ones? also what is the use of the non soldered header? anybody who has a PICKit 2 programmer? 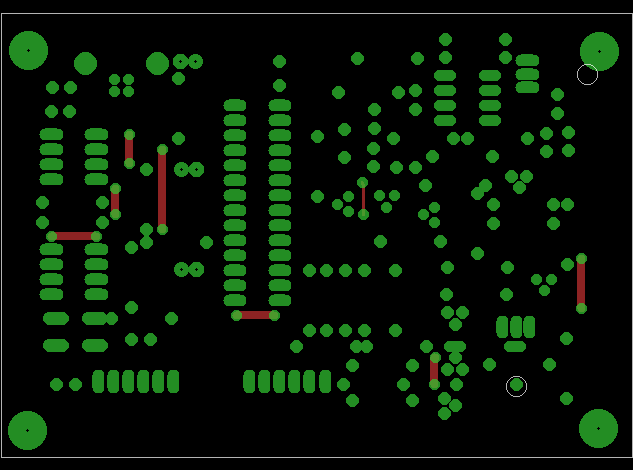 If I need to make the PICKit 2 Clone without "AT24CP" chips, what would be the schematic? Do I have make any modifications? Pls explain. Thank you for your reply. I have ordered the parts needed and once the project is completed I'll send you the result. On April 5, 2012 Laurentiu has stated there is an error on the schematic and as a solution he suggested removing R36. I've checked the downloaded zip file which has the schematics contains the same R36 (240Ohms). Can you rectify? Or if I'm wrong can you please give me the directions to download the revised schematics? i m really sorry about it,R36 must not be there and i have already updated the schematic witch is displayed on the page , but i forgot to update the zip file . Hello and thank you for posting such a nice circuit. I have few questions hope that you would help me. 1. Is the one of ICSP useless? 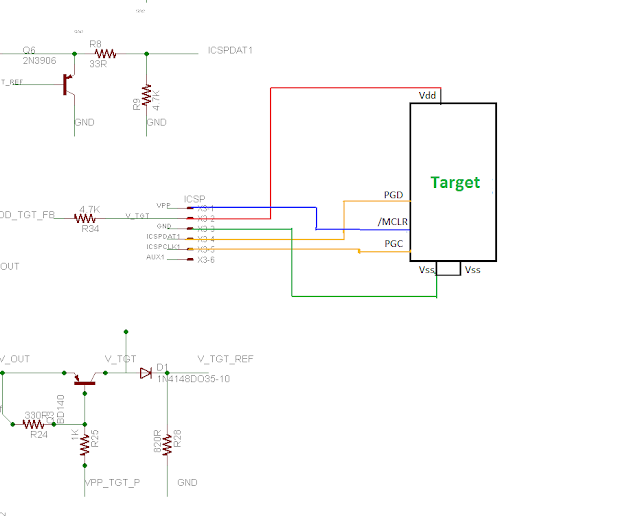 I do not see clear text on schematic and also your finished board only has one ICSP. 3.Is V_TGT near Diode D1 the output from pin X3-2? 5.What can I subsitute in place of 22 pf capacitor because The place where I live do not have supply for the ceramic capacitors. Yes debugger ,uart tool, logic analyzer are fully functional as in pickit . I have made this programmer (in addition to original one). It works fine, just same like original one. R36 was removed from SCH. 680 uH inductor is self-made. I have used a small ferrite ring. I was able to made exactly 680 uH because I have LC-meter. Vpp voltage is about 11.9 V. It is ok.
Hi, I am newcomer. I tryed this morning to download your PCB file, but the link is wrong. I get a message like the file is removed. how can i get your eagle files ? 1. pickit2 not detected i.e no driver installation phase. 2.T2 (3904) and inductor(630uh used) are excessively hot. Please help me out with your valuable suggestions. 1. when i connect my circuit to laptop, green leg glows permanently and yellow glows, but die out (off) slowly within 15 sec. 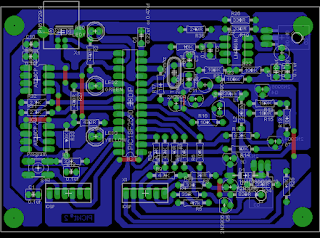 can i use the same pcb design and just dont use ic3 and ic4 (if i dont want that feature)?? Pls tell me that is this cicuit tested?? help me....I want to build one for me. sir , finally programmed my pic18f2550 with your serial programmer. pickit2 is detected but its showing '' pickit2 vpp voltage level error''. troubleshooting shows 1. vdd test pass 2. vpp test fail-> short or heavy load detected ..
my inductor gets very hot while operating pickit2. Hello Gaurav, nice cct, thanks. I don't have the 24cp512 eeproms but i have the higher 24FC1025. So i want to replace the two with one of this and with its select inputs connected as follows: A2=Vcc, A1=A0=GND. (it can't work otherwise) Will this replacement be ok? Thanks. Hey Gaurav!...I must say I love the simplicity with which you have mentioned the steps!...really ,thank you so much !. I have a few questions: Is the circuit made on a single sided through-hole PCB (only 1 layer). Or is it both sided? but you wanted to go for manufacturer then i guess pcb size would be very small. 1. how about watt each resistor put on pcb. what each value resistor 1/2W and 1 W? 2. how about volt each capacitor put on pcb. 25volt or 50 volt or 100 v? I want to built pickit clone. I need your help sir. I a newbie, please forgive me about my language. Hi, I am newcomer. I am trying to download nee fakt PCB file, but the link is wrong. I get a message like the file is removed. how can i get this eagle pcb files ? i have just tested the link and works just fine for me . even if you need the files on your email i will send there too. I have tryed again but it does not work. Tanks to email me files. Tested Clone PCB, Its working fine. But when I set the output voltage there is no change in the output Voltage. So will it support 3.3V CPU? i have tested the circuit, and the voltage can be set to 3.3v no problem at all. so it can work with 3.3v devices too. I have done test in two different PCB (One made by my friend and another Me). I set the output voltage to 3.3V and checked with multimeter. Output still shows 4.93V. if not and you built it from the schematic shown here be sure to download the latest schematic? I have built this circuit & everything works except the programmer-to-go feature. The red led starts blinking constantly after downloading of hex file to eeprom chips is complete. If anyone has solved this problem, please post the results. I've solved this problem but my board never gives 5v on the VDD target pin (ICSP Pin 2). However, if I put an external power supply through VDD target pin, the board works well. I have built the circuit exactly as said by you. used 2X 330uH inductors. I am getting VPP error, it is showing 10V. While troubleshooting VPP, transistor T1 gets hot. Where can the problem be? I just finished building this and i can't get it to work. I get it to connect with the PC, but it says i have a vdd error. Also, T1 gets hot sometimes, and Q2 gets worm. I measured VDD on the board, and it's under 1V. I also removed R36 from the circuit. Any ideas on what to test next ? I managed to make it connect to PC, but when i do the tests, the PCG pin in always off. Any idea on what transistor or any components i should check/replace ? I want to thank you for providing this circuit. I built the pickit following your schematic, but the problem is my laptop is not detecting the pickit. First of all as soon as i plug in the usb port in the slot there is no driver detection phase. Secondly after plugging, the LED1 is glowing but its way too dim. * No transistor or inductor is heating up. Any idea what could have went wrong? I complated it finally, after some transistor problems. I think 3d model and shematics shown wrong for Q2,Q3,Q4,Q6,T5. when i replace like your pictures it's work. But calibration util give an error like this http://s20.postimage.org/beq9vkpp9/pickit.jpg what can i do. "PICkit 2 VDD voltage level error. Check target & retry operation." please help me and give me a valuable suggestion. Is it possible to get the PCB for this programmer as I do not have the resources to make the PCB? "PICkit 2 VPP voltage level error. Transistor T2 2n3904, its emittor is it connected to anything, or its used just base and colector? 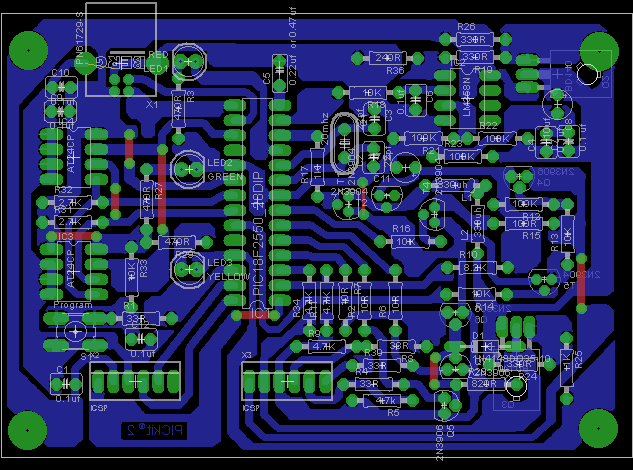 I have some schematic of PICKIT2 but its not full, and in boost circuit there is no T2 and there is 1n4148 insted. Can i use that diode insted, and if i use transistor emitor is not conected or? T2 2n3904 is used as a diode, do not warry. Using a Schottky diode here (20V) will probably give a better result, but it is ok with 2n3904. I have built this sch, it works fine. I also replaced 2 inductors with 1 sef made coil on small ferrite ring. Hello Gaurav Chaudhary, I would like to know if the PCB PDF file is on mirror, I mean if it ready to print it on a toner transfer sheet. Your PCB PDF file is corrupt. I want to print the PCB. Can you mail me on devangs3@gmail.com or upload a new file please..............? I am a hobbyist interested in making this programmer but do not have the resources to make the PCB. Does anyone have a spare PCB I would be really grateful. I am ready to bear the cost. I tried to redraw entire project, would you be kind enough to look at and check out any deficiencies. is it free from all deficiencies? if it is then please email me its pcb files.. This helped to get the voltages down to 2.5V. 330E is simply closing the Q3 (BD140) too soon. Normally the R24 should be 10x R25 (1k) but I stayed as low as possible. This also depends on the type of the BD140 transistors used. A hint: if you stay in country where the decimal delimiter is comma (,), not punctuation (. ), try to use comma when calibrating in Pickit2 -> Tool -> VDD Calibration ... when inserting the measurement 4.x Volts (e.g. 4,26 in my case). Although the hint in Pickit 2 says "4.000", the comma is just fine, otherwise an error "Could not fully calibrate the unit. The USB voltage may be too low to completely calibrate." does occur. Now everything works as charm (Vdd, Vpp, calibrating, programming). Good work, Gaurav! Greetings to all from Slovenia! i am try to programming in PIC18f4550, PICKIT2 are detected device but not program, programing time error "PROGRAMMING FAILED AT MEMORY ADDRESS 0x000000"
may be the target is faulty of ISP connections to the target are lose. is the vpp okey? around 12V. is this possible that you can try to program some other target? do you have any other mcu is sock. because i can tell you with experience that this error usually occur due to faulty target or lose ISP connections to the target are lose or you have used very long wires from the programmer to target board. chances of bad programmer are seems to be very less. the programmer shows successful message on 0xFFFF because its the default value on memory location. so your programmer is fail to write the device properly. i have displayed more then required images to describe how you can connect target to the programmer i believe that is adequate. 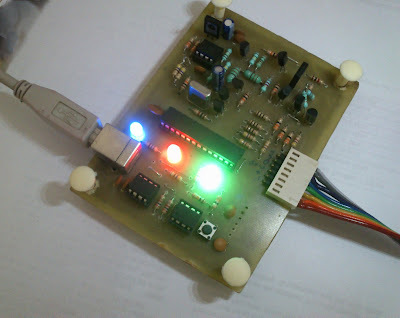 if you still need more examples then please check my other post how to connect this target device to programmer. supported device list is in the pickit2 user manual file that is all ready on the post. i hope at least you have read the post. as i said before there is some issue with the programming not reading the device. so programmer can read the device id and able to detected the device. please try with different target see if that can be programmed. what is vcc level when programming and reading the device. vcc level is 4.3v,& VPP 11.9v,device is detected, device is verifide, device is blank check, device is erased, read & than (FFFF)hex file is programmed successfully, but other hex file is not programmed. I have bought PicKit-3, though expansive - what is the pros and cons with the clone kit above? Pls enlighten me. Thanks in advance. pickit 2 is faster in few cases. you do't have to download new firmware into pickit 2 every time you work with different family. same will work for all. 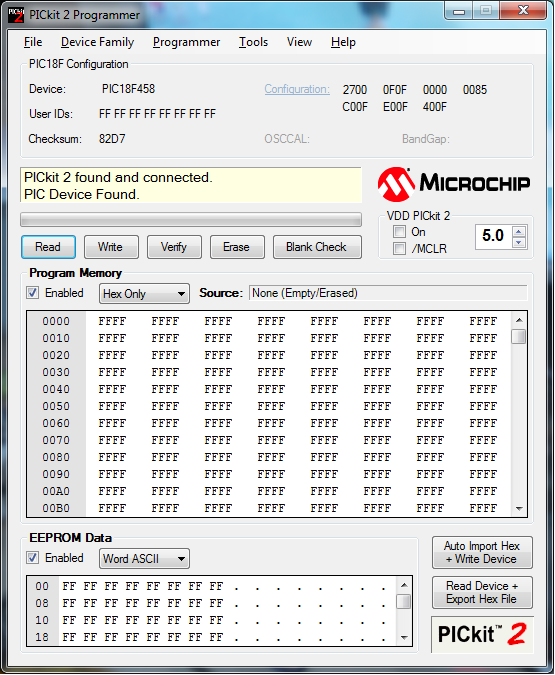 pickit 3 new , supported , compatible with all of the new ,old and upcoming microchip mcu while pickit 2 gone it will not update. I would like to make the pickit2 clone, but with SMD components where possible. 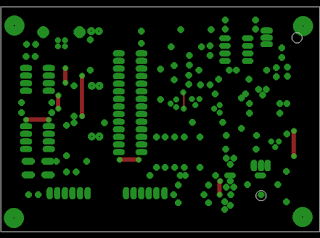 I was wondering whether you can upload the schematic file the same way you did with the other supporting files as i am using the same schematic/layout editor (Eagle) and like to re-design the pcb-layout with SMD components. Can you please leave a reply? there is no smd PCB design file is available. i hope you understand that , if you wanted to do a smd prototype, design it your self, its easy. if you wanted me to design one for you with investment of my time. i can send you a quote. i did't understand what exactly you are trying to say. Excuse me, can you please reply on my message from October 28th, please? 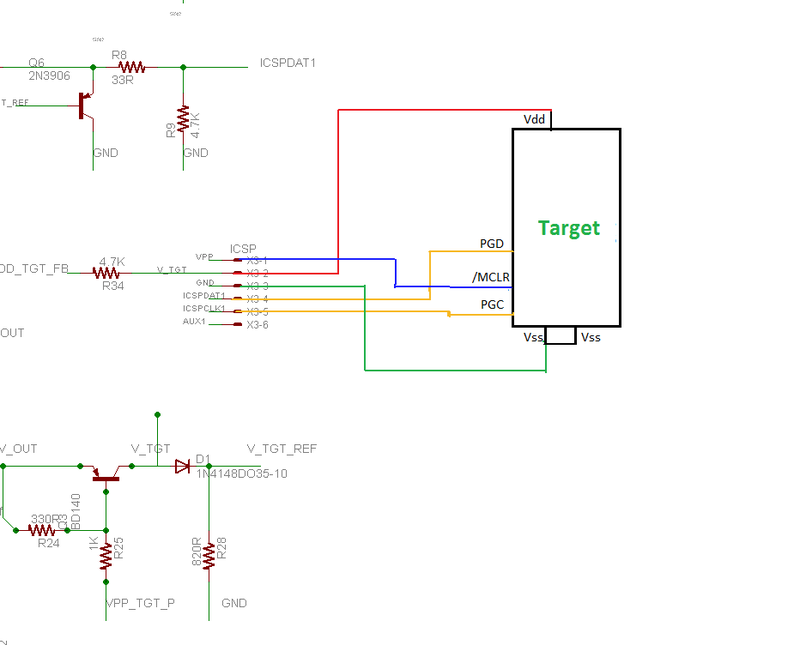 you will need only if you wanted to have capability of programming target mcu without the PC. if you do't want that function you can skip the eeproms , they are optional . programmer can function normal even without the eeproms. I did the pickit to the scheme published. but connect to the PC and not recognized. despite already welded all components. *can i use 800uH as my inductor (resistor type)? - isn't affect the circuit? *i found IC LM358N in my country, is this would work perfectly if i use it? or is it has a capability to have that spec quietly? Can I replace the PIC18F2550 with PIC18F4550 that i have available? The firmware will be compatible ? yes it is possible ,but you can't just directly burn the precompiled hex file into PIC18F2550 , you have recompile the code and may be make a very tiny adjustments according to that. Why you don't use RB3, Vdd TGT N ? Hi, I need advice. I do not know where it leads emitter terminal T2 2N3904. It leads to GND? Thank you. can any one please explain connections and components connected to pin 26.
i made that ur pickit2 clone but whenever i connect it to usb it say usb device not recognized... i programmed that PIC18F2550 with your serial programmer... and programmed hex file successfully.. but still giving this error..plz help me.. every connections seems to be okay. sir I would like to build a 1000 watt inverter pure sinewave 50hz using pic 16F628A MuC. now it shows vpp error...while trouble shooting with pickit2 software it shows short or load detected message...should i change the inductor to 330..or is it ok with 470.. Looking nice circuit ,,,,,, I shall try to build it in the near future. I liked you post and i am looking forward to make this programmer. But there is one request that can you upload the eagle project file so that i can redesign the pcb instead of designing the schematic from image file. can u send this project in eagle files? The pcb picture shows two inductors and the schematic is only 1 shown? And could you mail the .sch and. brd files of eagle to the egscheers@gmail.com. tnx for that and tnx for this clone pcb. u can use jumper for one inductor. Or two inductor in series. or are there 2 inductors of 340UH in sequence? Its a Very interesting Clone ... I intend to try ..
but i have a question .. does the EEPROM Chips hase to be 64k >> 24C512 .. can it be less or more ??? also what are the substitutes for 24C512 CHIP or AT24CP ??? thank you for this circuit. I have made this programmer. It worked fine on the first connection. No problem :). The serial programmer for 18F2550 the same, no problem. I would like to ask you how is the procedure of programming without PC. Is the second connector for it? How can i to test this? Hi! I have made this programmer, and it working very vell. But I am a beginner and, I have a few questions. This scheme does not support self-test, does not it? Why? The problem in the firmware or in the schematic? The schematic have two ICSP. One for programming, and for what purpose is the second? For in-circuit programming own PIC18F2550? What is the purpose of AUX1 in ICSP? Whether it is necessary to program any special chips? May I have the Eagle files? I need to make some adjustments to be able to fit it on the copper board i have. Sar Do u have Tested the programmer to go feature in the circuit!! Am a newbie to PCB and schematics like these and i know nothing on this. I did the pic clone referring your guidelines here. I am successful in downloading the firmware into 18F2550 via serial programmer and Pic Kit clone is detected in PC. I face few problems. Heating problem of inductor gone away after i replaced the 2N3094 transistors. 2. In VDD & calibration dialog i am not able to do calibration. Its returning "calibration cannot be done. USB voltage low"
i. First step of VDD calibration returned error. 4.5 volts is expected but the actual voltage is 4.2 /4.3 Volts both in the measured space in application & measured with multimeter. The Window throws error as "low VDD voltage. pull down problem "
Please help me. sorry if am asking silly queries. i removed the R36 240 ohm resistor and vdd calibration is successful. Am facing vpp error. i tried to troubleshoot using pic application - it throws error as short or heavy load. also the T1 whose collector is connected to L1 is getting hotter during vpp test. am helpless and i request help and suggestion to make this clone work . pls help.